Palace have won just one of their past 11 Premier League games against Newcastle after this bore draw. Nobody got this spot-on, but 3 did have the outcome. There were 26 who predicted a win for Palace. Liverpool won a seventh straight game in all competitions from the start of a season for the first time in 28 years. A decent 9 had this spot-on, with a further 21 getting the outcome. Paul Hurst is still waiting for his first win as Ipswich manager after they were held to a home stalemate by 10-man Bolton. Nobody got 3 points for this, though 7 did have the outcome. A first League home win since April for Reading, with ex-U's Sam Walker getting his first clean sheet. Again nobody had this spot-on, but 16 did get the outcome. An 88th minute winner for Charlton as they came from behind to beat Plymouth and record their fourth successive victory. That late winner was good news for the 4 who got this spot-on, and the 24 who had the outcome, with 14 going for a 2-0, in what was the weeks most predicted result. A John Marquis double helped Doncaster to victory against Bradford, whose search for a first win under David Hopkin continues. A massive 12 had this spot-on, and a further 14 got the outcome. A single goal was enough to give Port Vale a first away win in 17 games. Just the 2 got this spot-on, and 3 more had the outcome. Promotion favourites County are still looking for their first win after this bore draw. Again only 2 had this spot-on, with 7 more getting the outcome. A stoppage-time penalty from ex-U's loanee Blair Turgott wins it for Maidstone. Well done to Tropical_Us for being the only one to get this spot-on, and another 3 had the outcome. There were 20 who predicted Braintree would get their first win at home this season. Orient continue with their unbeaten start to the season, as they bring an end to Harrogate's unbeaten record, with ex-U's Bonne scoring their first. Nobody had this spot-on, but 9 did get the outcome. A mixed bag of results this week, with three bore draws, the 3-0 wins for Reading and Orient, and the 1-0 wins for Port Vale and Maidstone, making it difficult to find those important 3 pointers. But with the three banker bets Liverpool, Charlton and Doncaster all winning we ended with a decent amount of 30 spot-ons and a seasons best total of 197 points was achieved. Just one member managed to have three 3 pointers that was basher2010, who had the wins for Liverpool, Doncaster and Port Vale, and with three outcomes he is this weeks top scorer with a brilliant 12 points, that equals his best ever score. The one to come out best of the seven who had two 3 pointers was blueeagle, who had the Liverpool 3-0 and the good Northampton bore draw pick, on his way to an excellent 10 points, and a highest score in his first season. In The Premier One 3 pointer and five outcomes for the top two means RSCOSWORTH maintains his 5 point lead over gsy163. Two 3 pointers for gerry_us, (the Doncaster 2-1 and the good Northampton bore draw pick), and for sevebalo, (the wins for Liverpool and Port Vale), gave them both a very decent 9 points, and moved them up a place into a seasons high position. Current champ thrillseeker has more outcomes than anybody in both divisions, and a 3 pointer for the third week running, moves him up another two places. Even though he trebled his 3 pointer total for the season mfb_cufc still remains bottom. In Division One Two 3 pointers for the top two Colukev (the wins for Liverpool and Charlton) and oxfcolu (the wins for Liverpool and Doncaster) to give them both a decent 8 points, and that means the gap between them remains at 6 points. The top scoring effort from basher2010 has moved him up a massive ten places into third. Just behind him moving up five places is the weeks other big hitter blueeagle. 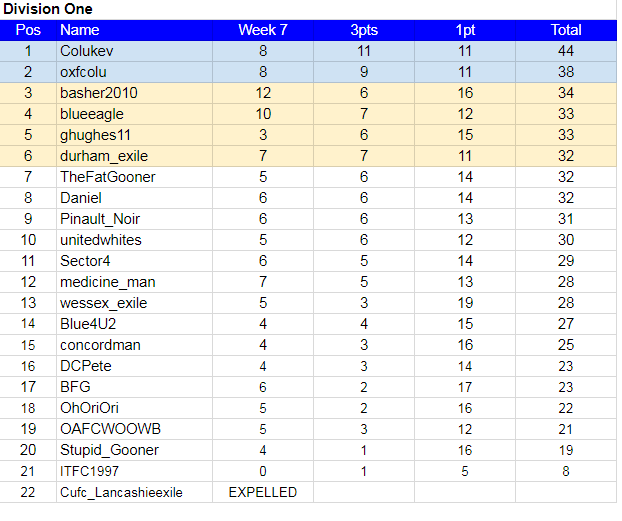 A seasons best score for Daniel, but he drops out of the play-off places, where he is replaced by durham_exile, who had the wins for Liverpool and Doncaster spot-on.. The Champions League qualification will be decided after Week 21, so we are a third of the way there. With BFG qualifying as the holder, the other places will be decided by the eleven highest point scorers over the two divisions. The member currently occupying that final qualifying spot is Tropical_Us with his 33 points. Hard to predict Wycscum and Scumend match. Went for a boring 0-0! Never back one of them to win! Imagine League 1 next year with Col U and Ips, Wyc and Scumend!